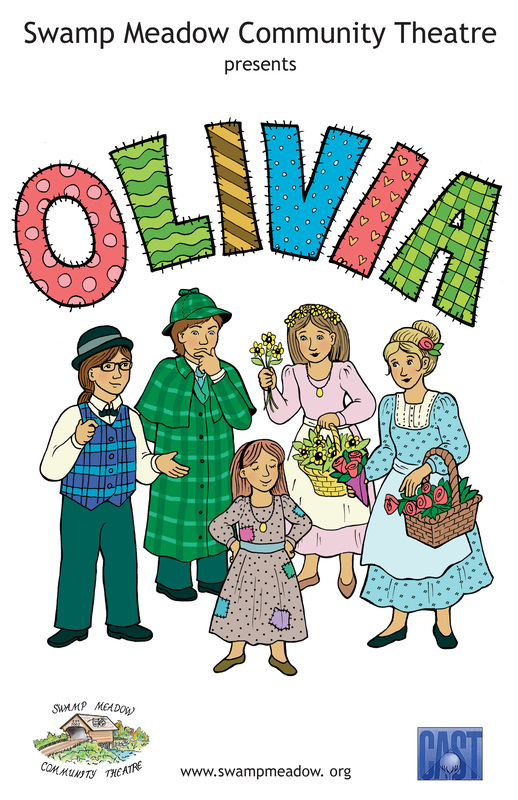 “Olivia” is the female version of “Oliver!” – with a Twist. Not just limited to Charles Dickens, this children’s musical featured many characters and plot lines from a broad range of British literature, film, and theatre. Rosemary Paolucci was the director for this show. The play was performed in August 2010. Olivia– Abigail Dexter, Eliza Doolittle– Emily Carter, Annie– Seanna Fessenden, Queenie- Lauren Bretanna, Doris- Isabella Giorgianni, Flo- Katie Fidler, Flower Seller- Alice Lear, Fagin- Nigel Richards, Dodger- Devlin Cook-Hines, Oliver Twist- Sarah Johnston, Bob- Julia Ellis, Walter- Joe Milia, Bill- Katharynne Hebert, Jack the Lad- Christopher Hebert , Little Jim- Anna Milia, Tiny Tim – Ben Cerullo, Lamplighter- Alex Cerullo, Sherlock Holmes- Brian Wolf-Jensen, Doctor Watson- Audrey Dubois, Mrs. Hudson- Sarah Johnston, Ebenezer Scrooge- Emily Dubois, George Bernard Shaw- Sarah Bucknam, The Usher- Rebecca Green, The Judge- Tyler Vigeant, Criminal – Hannah Gibb, Daughter- Michelle Chretien, Constable- Jake Farnum, Gentleman- Jack Affleck, Orphans- 1. Ruth Lear, 2. Emily Duquette, 3. Anna Hughes, 4. Zachariah Fessenden, 5. Brittany Fessenden, 6. Anthony Piccolo, 7. Shannon Simoneau, 8. Sarah Lear, 9. Amelia Dexter, 10. Michael Resnick, Mrs. Murdstone- Chase Lurgio, Dicken- Audrey Buffi, Mrs. Debler- Katelyn Fessenden, The Girls, Charlotte– Jill Cerullo, Emily- Maddie Shea, Belinda- Evelyn Dubois, Belle- Emily Chretien, Little Doritt- Harris Cook-Hines, Derbile- Jessamine Phillips, Chorus- Sarina Resnick, Molly Rush, Jack Affleck, Tess Safford, Isabella Duquette, and Jessamine Phillips.